1) Technically that is not a lie because it isn’t new it has been sitting in my closet for over a year~and I did I cut the tags off recently. I guess some would say that is still new, because you never wore it. Hmph. It’s a is the glass of water half empty or half full thing. 2) This is not a dress! It is actually a sweater- in extra large XL! I do that often- I buy shirts or sweaters oversized because they look so effortless as a dress. The small in this dress would not have been able to have been worn as a dress at all- it fell right below the underwear line. That’s a lot of more fabric from a small to xl. I love how this sweater looks so cozy. Pairing it with these flat gladiator sandals give it a cozy but bold vibe. It’s an outfit you’d wear on a slightly chilly day. Perfect for fall weather or right now! Fall or that 1 month transition from spring to summer- (mid may- mid june) = sweater weather. 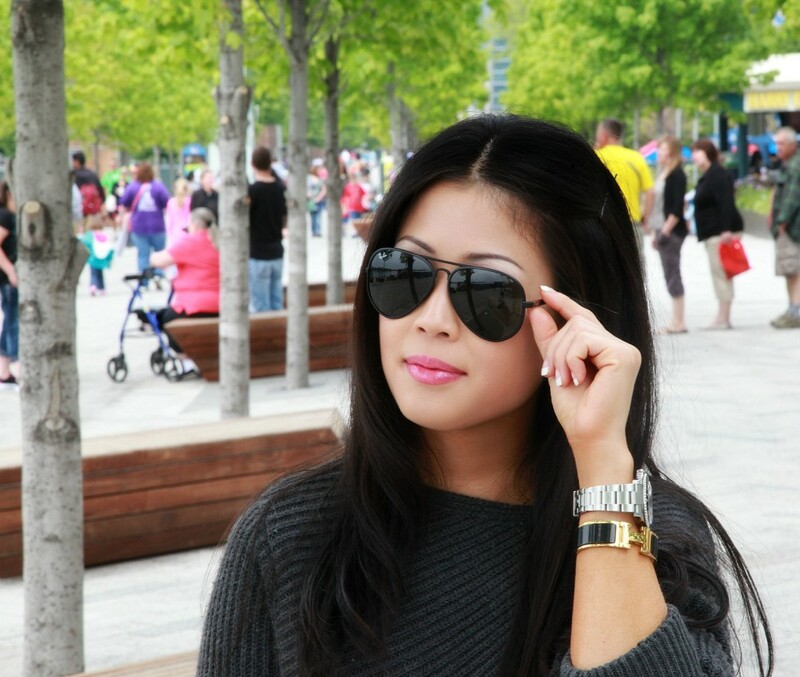 black aviators and a couple of investment piece accessories make always make an outfit chic. Hope you are enjoying this weather as much as I am right now! also crushing on your black ray bans for sure. Super cute! I love that this is actually a sweater! It looks fabulous as a dress! I sure love a big sweater worn as a dress, and yours looks terrific. I’ve never found one so long though and always have to go with leggings. Funny about having unworn ‘new/old’ things in your closet! I too am guilty of it, but so is my husband. He says he likes to have something ‘fresh’ to wear when he needs it, so keeps a stash of a few basics. ah what a great idea! how do you get around the width of the sweater though? presumably it sizes up along with the length 🙂 love the assymetric knit lines! lol right? thank you xo! Wow! I love this outfit specially your sandals! Those sandals are amazing! you look absolutely fab in this dress! this is so great indeed 🙂 have a lovely day! That sweater looks great on you as a dress! Love the texture and pairing with the gladiator sandals. Hope you had a wonderful weekend! it’s too hot to wear our sweaters in Texas but i love your tip of sizing up to wear as a dress! this is a great look with the gladiator sandals.